Free of: BPA, PVC, lead, PS, PA, PET, BPS, phthalates, nitrosamine, and harmful chemicals. Created to address the growing concern of harmful chemicals leaching from consumer products. 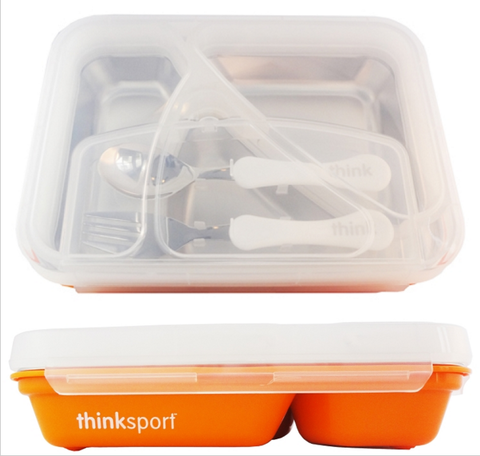 GO2 container is ideal for school, work, travel, camping or around the house. GO2 Container comes in Blue, Orange, White and Pink! Fork and spoon secured. No losing utensils. Large compartments make it easy to place food for lighter to heavy fare. Just fill…and GO! Modern and highly functional. From the moment that you hold the GO2 container, you will understand that it is a very sturdy, well-designed product. No skid design, because nobody wants their meatballs on the floor. 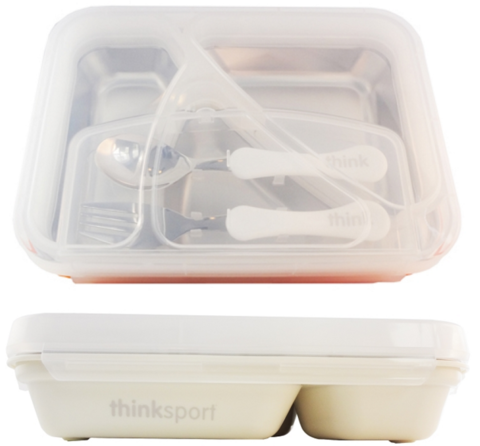 Unlike many other lunch style boxes, the GO2 container seals off each compartment. You can literally fill each compartment with different colored water, shake it and not have the colors mix. This was no easy feat. But nobody likes having their sandwich soggy because some sort of sauce or juice flowed into that compartment. 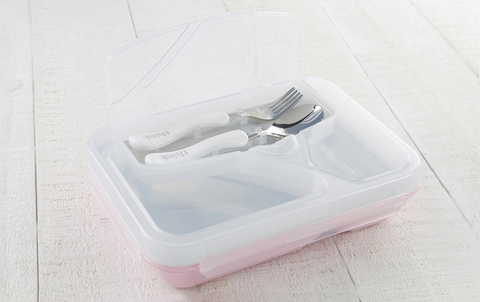 There are also a few lunch containers that have lids for each compartment. This creates a lot of cleaning and high probability that lids end up getting lost. 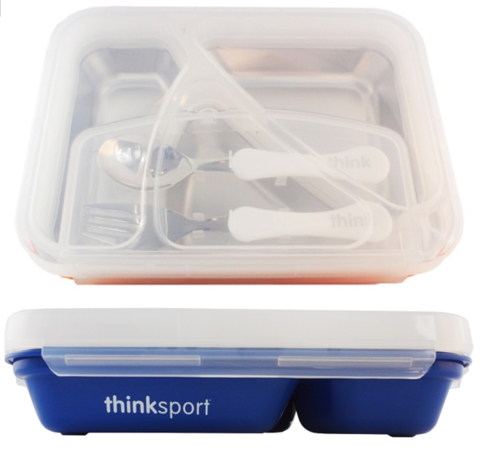 The GO2 container features an embedded silicone matrix to seal off each area completely. And finally, we built in our very stylish, ergonomic fork and spoon so that it easily fits into its own compartment. No more forks and spoons getting lost. And its just utterly convenient to have a place to store them so that they are not loose during travel. As with all Thinkbaby and Thinksport products, we apply our strict material standards to everything that we do. 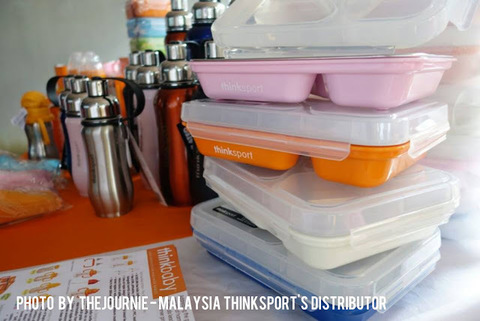 So no, phthalates, BPA, BPS, PET, lead, melamine, nitrosamines or biologically harmful chemicals.